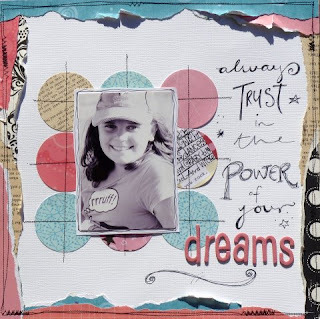 I do enjoy my spot on the Design Team for Show Us Your Stuff - the challenges are always something a bit different from other scrapbooking challenge sites, and the best part.......the focus is on HAND MADE elements. The site has had a snazzy update recently. A new look plus a simplified format for challenges - just one per month, plus one Young Scrappers (Sophie's Corner) challenge per month. As you can see, I went with the colour scheme, the newsprint and the circles. All the papers are old scraps. My handmade item is the photo mat I created using 9 punched circles sewn down with my sewing machine. Some Thickers letter stickers and some hand lettering for the title completes a very simple (and inexpensive!) page! 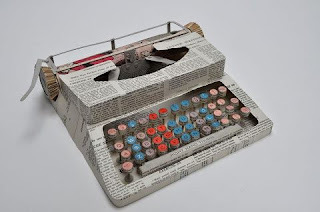 That typewriter is really cool, and I love your take on the challenge.